Magnificent views abound from this oceanfront home. 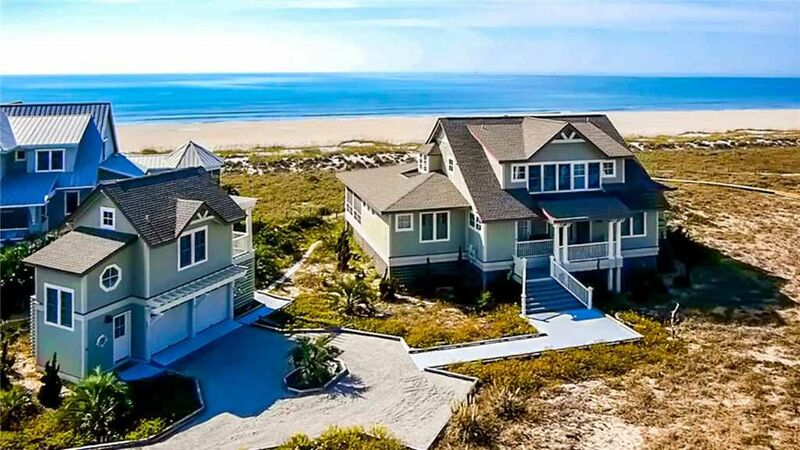 Uninterrupted ocean views from open decks and a screened porch are breathtaking. The detached crofter offers additional privacy. Large open areas and spaces for fun and gatherings abound within this beautiful home. Sleeps 12(max.). 6 bedrooms including crofter (1K-1K-1K-1BB-1TR-1Q). 4 full baths. 1 half bath. Additional Shower in Laundry. (1) 4 passenger and (1) 6 passenger carts. Direct beach access. Saturday/Saturday. 4:30 p.m. arrival/10:30 a.m. departure. Wonderful house and wonderful location. I would change nothing about our weekend get way. The house was clean, the view is amazing. We did have some electrical issues that were handled immediately. The check in process was great and the people were kind. Great house with a perfect layout and location. We will be back! Thank you for your comments and the picture! We'll see you back on the island soon! I want to let you know that our 3-days in BHI was an absolute experience. Everything went perfectly – the homes were OUTSTANDING (especially Summer Island) but they were all spectacular. I wish you could have seen the faces on everybody when they saw the island for the first time. The Maritime market did an outstanding job on all of our catering. The progressive dinner was so much fun! Thank you for your comments. We are so happy to hear you all had a wonderful experience. We hope to see you all back soon.